I love approaching weaving from an artist’s mindset, meaning I like to weave works of art that convey an idea or concept. This might be weaving a specific pattern or color to convey a feeling, or adding embroidery to tell a story. So for me, I don’t feel the need to necessarily “do” anything with my weavings because they do something on their own – they’re art! The other approach to weaving is from a crafting, DIY perspective. In answer to,”Can you make more than just scarves?,” the answer is absolutely! There are soooo many things you can weave. Some projects include table runners, dish towels, blankets, coasters and pot holders – to name a few. These projects are all straightforward (or, I should say, rectangular) and don’t require any sewing. But what if you feel like moving beyond the basic rectangle? In that case, the possibilities are endless! This is something I’m just starting to explore more myself, so I know how scary it can be to take a pair of scissors to your precious handwoven cloth. This product is an absolute Godsend and you can buy a two-pack on Amazon for under $10. Worth. Every. Penny. So what exactly is Fray Check you ask? Essentially, a glue that helps keep your cloth from fraying. Designed for sewers, it works just as well for weavers! Using Fray Check, you can bind your cloth together where you’re going to cut it. Both of the projects featured in this post I put together with the help of my handy-dandy friend, Fray Check. Decide where you will be cutting your cloth and run a line of Fray Check across. (Do this in a well-ventilated area). Allow the Fray Check to dry. Once dry, turn the cloth over and put a corresponding line of Fray Check on the other side. Once the fabric is completely dry, you can go ahead and make your cut! Use sharp scissors to give yourself a nice, clean cut. Use this trick to start transforming your beautiful cloth into different projects. If you’re nervous about fraying edges, you can also run stitches across the edges to make them extra secure. Depending on the weight of the yarn, you can either run the cloth under the sewing machine with thread or hand sew it with yarn leftover from your project. Not sure what you want to make first? Check out some of these ideas on Pinterest. Even though it is still technically summer, my eagerness for fall has resulted in my house already being decorated for the upcoming season! 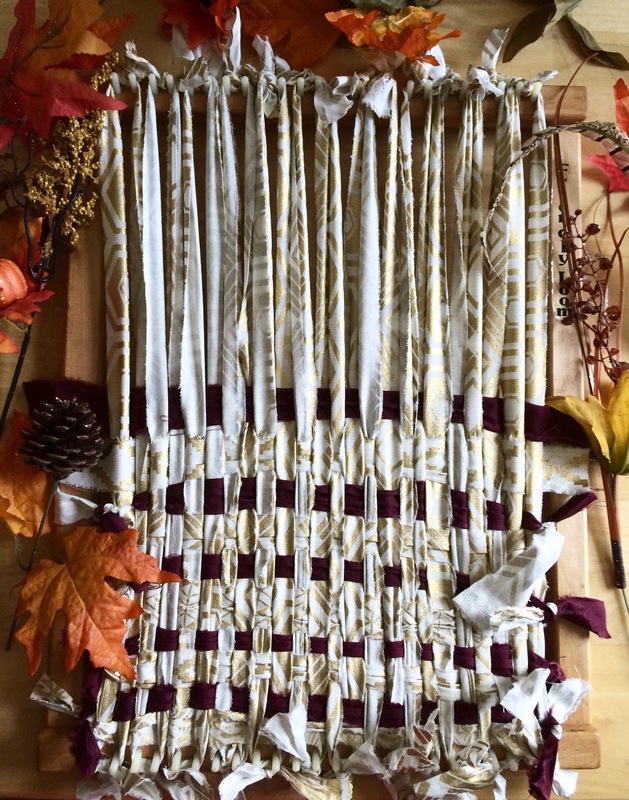 To add a pop of color to my dining room table, I wove this fall-inspired textile using commercial fabric and a tapestry loom. For full instructions on making these table settings, click here. Today I’m bringing some DIY to the site with woven placemats! Having taken a number of fibers courses at SUNY Cortland, I have been looking for a way to incorporate more weaving into my life. I can across this idea in a book and decided it would be a fun and inexpensive weaving project. True to what I thought, this project was enjoyable, simple and may prove inspirational to those of you who are already planning holiday gifts. Below you will find instructions on how to make these placemats for yourself. Fabric: The first step, of course, is to pick out your fabric. I used fabric from Walmart, picking several designs from the quilter’s quarters you can find in the sewing section. Of course you can also find fabric at most craft stores or reuse textiles from around your house. Cut: Once you have your fabric you can proceed to rip it into 1”-wide strips. Warp: In weaving, the vertical strings (or in this case fabric) that you weave onto is called the warp. To make my warp, I tied the fabric strips onto my small tapestry loom which, conveniently enough, is the same size as a standard placemat. If you do not have a tapestry loom, you can make your warp on a cork-board, securing the fabric strips with push-pins. Weave: Once your warp is finished you proceed to weaving. Simply follow the basic over-and-under weaving technique (like I did) or feel free to get more creative! 5.Tie: The last step is to tie the tails of the fabric strips together, giving the placemat a fringe. You can leave the fringe as long or as short as you want. So, whether you are making these for your own dining room or plan on giving them away as gifts, these placemats are a fun project that will also give you a sense of accomplishment!